I emailed Jaimie Fuller multiple times stressing that the issue of data integrity and that he ought to secure Rob's TomTom account. 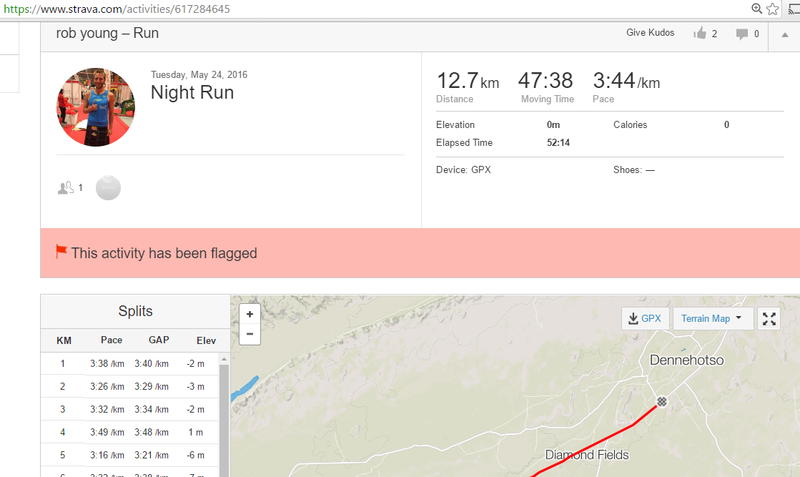 I shared the summary image from the blog (http://ryinvestigation.blogspot.com/2016/06/bannocklaughlin-incident-follow-up.html) and re-iterated that the Strava data is incomplete, manipulated, etc. etc. He didn't seem to totally understand and it seems he's pretty hands-off/delegating this for now, but reiterated that the panel will investigate everything and said "If there is data manipulation I am assured it will be discovered with some forensic analysis". You, my (as yet not met) friend have GRIT by the bucket load. Thank you for helping me dream bigger than I could possibly imagine. This bit is indeputable support for Rob's innocence. His abilities are directly evidenced by his grit. Here are some images from FB that I downloaded. Don't know if these include any that were removed from the facebook page currently or not. One is the section through Lebo. The other 3 are from May 31 - June 1 including some fairly unlikely to be legit tracks. This stuff has been mentioned before, but it would be nice to have a graphic on it. People might have something in the browser cache. It's a little tedious, but some of the more tech-savvy could do it if they're still in the cache. Summary: Some guy did sumpin' wrong... at leas' ova folks tink he prolly done, so dah ova folks got angry and bringin' dah in'ernet heat yo! People might have what in the cache? Yes I think quantifying what is "missing" would be cool. If we make a Strava activity of his entire RV ride, will all the runs show up on fly-by? I think the "gap" analysis may be unfruitful due to breaks. For example, we know he didn't run unsupported in the desert that day of the RV breakdown, but a simple analysis of: Point X: 8:15AM ----> Point Y (35 miles away): 8:00PM is not going to look suspicious. We only know from a blog photo when he actually got to Point Y, not just when he started again from there. I'm not sure how to do this, maybe some of the whizs out there can help. I can try to convert all of Rob's GPX files to CSV, then bring those into the KML spreadsheet - then... step 3: profit? The only thing I can think, is for each KML point, check if its close to a GPS point, and if so, discard it? Seems insane to brute force a check of every GPS point though. Maybe check against points that day? Let me know if someone can do it and I'll supply a CSV file of all the GPS points. I just tried making one and it's got too many rows for Excel, but if split into a couple or few files it may work. 1. Activity Flag: The activity flag can be found on any activity page, and can be used to flag another user's ride when there is evidence of GPS errors that lead to inaccurate segment times, or evidence that the data was driven in a car. If you have inaccurate segment times or data driven in a car, you can use the crop tool or contact support for more help. NOTE: All flagged activities will be removed from leaderboards until the flag is resolved. Once an activity is flagged, a notification is sent to the owner of the activity, with instructions to resolve the flag or seek further help from Strava Support." Presumably Rob has been contacted by strava and is in the process of resolving these flagged activities. You just get an email where you can explain yourself to re-instate the activity. If not it just stays flagged.